Fables are few and far between these days unless you count Paolo Coelho and his are tales of mystical human experiences. After Aesop and the Panchatantra, George Orwell’s was the most definite and that was more in cautionery satire territory. Samarpan’s third book after Tiya and Param, Junglezen Sheru is a story that sets out sounding like The Lion King and then takes quite a different turn, in total contradiction to the Panchatantra tradition which was created to teach princes the principles of kingship through fables featuring animals. In a jungle where the lion was killed by poachers, the lion cub who survived the attack has no power and no sense of identity. Sheru has a wise teacher in Muktak the Elephant but fails to understand that he is a lion and that his duty is to assume the strength of his lion hood. Instead, the jungle kingdom goes to the monkeys, namely to a monkey who escaped from the circus and is out of place in the wilds. The monkey is aided and abetted by a jackal who is cunning, as expected. Gradually the laws of the jungle go to rack and ruin because the flatterers and unwise are in the majority and alliances keep changing. Some of it is reminiscent of George Orwell with its ‘all animals are equal and some are more equal than others’ undercurrents. The jungle world that Samarpan describes is of course a metaphor for human society, celebrated by sayings like everyone is equal and by a movement to rechristen the animals collectively as Jungle Zen rather than identify them as members of different species. At the forefront is the lost lion cub Sheru who is too busy looking for love and friendship to realise that he is actually the king of the beasts. As a result he allows himself to be manipulated by the monkey ruler and his henchmen. Junglezen Sheru has its moments of humour, as when the donkey accidentally kicks the invading wolf leader and is promptly promoted to the top ranks of the governing counsel, or when the growing lion cub takes to farming lettuce. One frantically searches for political parallels thinking that the writer intended to draw his lessons from world trends but the lessons make their effect felt without any real necessity for parallels. The elephant is wise, the turtle, 300 years old and wiser, but capable of free floating away from all ties. And then there is the materialistic python who has his own kind of wisdom and is entirely selfish. All three attempts to indoctrinate the lion cub into the ways of correct jungle lore and only the materialist is close to succeeding. The wise turtle sees no sense in even trying because detachment has allowed him to survive for 300 years. And detachment is apparently the only way to achieve true piece of mind. Samarpan surprises the reader with his ending – Junglezen Sheru does not climax in the expected way. In fact exactly what happens is left to the reader’s imagination. 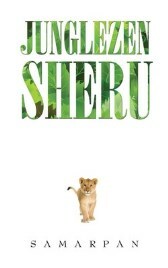 One Comment on "Junglezen Sheru"
It is an excellent review.